EASY Pac packaging machine can handle virtually all kind of free flowing solids. 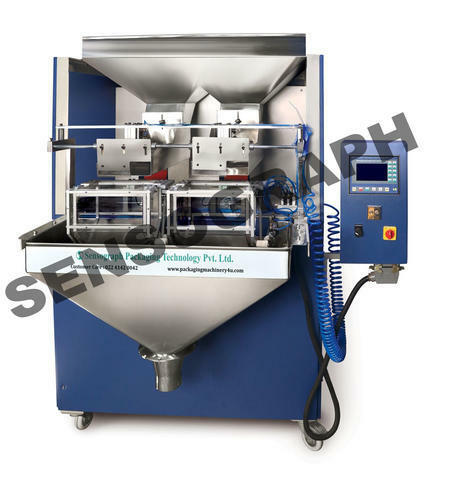 This packaging equipment handles grocery items such as rice, pulses, chana dal, toor dal, sugar, wheat, tea powder, green peas, white mutter and other items such as Namkeens, farsans, Chips, Frymes and similar products without any change parts or making changes in the settings, one can keep on toggling with different materials & different target weights on the same packing machine. Thanks to “Self learning software” developed by our R & D team. Solid granular uneven shaped products can be handled in one machine. Timer, Auto dumping, Foot switch facility provided. No wear & tear as no moving parts in machine.